“Spinning off directly from the hit CW television series ARROW comes the Emerald Archerer in these digital-first adventures! While I don't usually read comic books, I had to read the tie-in Arrow comics written by Marc Guggenheim and Andrew Kreisberg. I recently fell in deep obsession with the show Arrow (Oliver and Felicity? Yes, please.) so when I discovered that there were actually Arrow comics that tied into the story arc of the TV show, reading the comics became an itch I just had to scratch. Each individual story in the comic gives us little details on the characters lives between episodes, sometimes even between scenes. While they're not necessary to enjoy the show, I do believe they add a little something. There are some really cool scenes, and some very funny ones. Even some that had me laughing out loud. There are some really nice interactions between Team Arrow that we missed out on during the show. However, without having seen the TV show, you'll be utterly lost, so don't go picking these up unless you've watched the entire first season of Arrow. And, yes, there are spoilers if you haven't seen the entire first season. So if you haven't had the pleasure, go and watch Arrow season one, like, immediately. If you're like me then the artwork in comics is one of the main draws. And the artwork in Arrow: Volumes 1 & 2 is fantastic. Somehow both light and dark at the same time, sort of like the atmosphere of the show. I read a digital copy of these, but I'm kicking myself for not getting the physical copy so that I could really enjoy the art. The depictions of the characters (drawn as the actors who play them) were pretty good likenesses, which was important to me since I imagine the characters looking like their actors. I highly recommend giving Arrow: Volumes 1 & 2 a try if you're a fan of the TV series. Especially since Marc Guggenheim is currently releasing Arrow: Season 2.5, which tells the story of what happens to the characters between seasons two and through season three (I've read the first two and they are awesome). For more about Arrow: Volume 1 check out these sites! 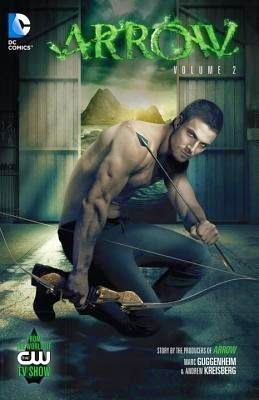 For more about Arrow: Volume 2 check out these sites!